While there have been many different ensembles of clothing worn by astronauts, the term "space suit" generally refers to the total life-support system for Extra-Vehicular Activity (EVA) that takes place outside the shelter of the spacecraft. The extreme conditions of outer space demand ensembles for EVA that are among the most complex clothing items ever designed. There are a variety of environmental conditions in outer space that humans cannot survive. Temperatures on the moon, for example, range from +250° F. to -250° F. (+121° C. to -157° C.). These temperature extremes are experienced instantly, as one moves from sunlight into shade. Astronauts are exposed to cosmic rays and charged particles from the sun. There is little filtration of ultra-violet light, so they must also have significant protection for their eyes. The absence of atmosphere means that there is neither oxygen for breathing nor atmospheric pressure to keep body tissues intact. Without at least a portion of the pressure of the Earth's atmosphere on the body, its fluids begin to boil and migrate outward. When unprotected a person becomes unconscious in 15 seconds, with death quickly following. Finally, micrometeoroids are small particle-like grains of sand that travel at great rates of speed. These pose the threat of suit puncture and the risk of loss of pressure. Most space suits comprise many layers of fabric, grouped to serve three basic functions: (1) application of pressure, (2) thermal and impact protection from the environment, and (3) thermal and general comfort. Accessories add breathing air, abrasion protection, vision protection, and communications tools. The precursors to the space suit, the pressure suits worn by high-altitude pilots, focused almost exclusively on one function: application of pressure. In 1934, Wiley Post developed the first pressure suit as a practical alternative to pressurizing his plane. His suit was pressurized with pure oxygen, which also provided him with breathing air, and was shaped to his position in the cockpit. As with several generations of suits that followed, it was almost impossible to move in Post's suit once it was inflated. The first true space suits, worn by astronauts in the Mercury program in 1961, provided air for breathing and cooling and allowed for emergency inflation in case the pressurization of the spacecraft failed. Using inflation only as an emergency measure solved the movement problems created by Post's suit. The Mercury suits also had an outer layer of aluminized Mylar for thermal protection. When a walk outside the spacecraft was planned for the Gemini program in 1962, it became clear that a new suit design was needed. Astronauts would need more mobility and greatly increased thermal and micrometeoroid protection. A specially constructed "link-net" fabric covered the suit's "bladder" layer, the inflated neoprene suit used for pressure to keep the suit from ballooning. This made it easier for astronauts to move. For thermal and micrometeoroid protection, the Gemini suits relied on high-temperature nylons and nonflammable metals, with the outermost layer of the Gemini IX pants being made of a woven stainless steel. Gemini suits were air-cooled using umbilical cords that tethered astronauts to the spacecraft. The astronauts complained that these suits were too warm and reported that the air fogged their helmet visors. The EVA ensemble for the Apollo moonwalk in 1969 included a number of new features: gloves with rubberized fingertips; overboots for abrasion protection; and extra visors for eye protection. To increase thermal comfort, a Liquid Cooling and Ventilation Garment (LCVG) was used. It consisted of a stretchable bodysuit with cooled water circulating in tubing covering a major portion of the body. Excess body heat was conducted to the water in the tubing, then cooled and recirculated. A backpack, the Portable Life Support System (PLSS), enabled the astronaut to travel in outer space entirely without connection to the spacecraft. The Thermal Micrometeoroid Garment (TMG), which covered the Apollo suit, provided protection from puncture and temperature extremes. It incorporated multiple layers of fabrics, many of them aluminized with spacers (noncollapsible structures that incorporated many protected air spaces) in between them. The outer layer was made of Teflon-coated Beta Fiberglas, which was resistant to ignition and melting. Molded rubber constant-volume bellows joints at the shoulders, elbows, hips, and knees greatly improved mobility over earlier suits. The entire EVA ensemble weighed 180 pounds (82 kg) on Earth, but only 30 pounds (14 kg) in the moon's gravity. This basic Apollo spacesuit was also used for space walking during the Skylab missions. The unique goals for the Shuttle missions were reflected in the Shuttle space suit, the Extravehicular Mobility Unit (EMU). The EMU was not custom-made or designed to be used on a single mission, as were previous suits. The upper torso, lower torso, arms, and gloves were manufactured in different sizes that could be assembled to fit almost any body size and shape. 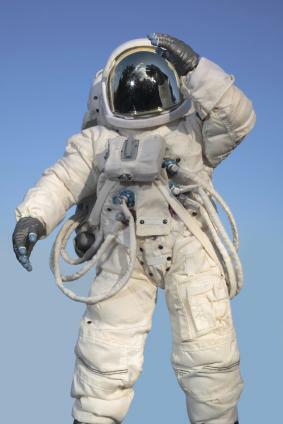 Suits were designed to last for fifteen years and many missions. The EMU weighed almost twice as much as the Apollo EVA suits, but this was acceptable since they would be used in microgravity rather than within the gravitational pull of a planet. The outer layer of the Shuttle suits was an ortho fabric-a blend of Teflon, Nomex, and Kevlar fibers in a unique weave. This covered seven layers of aluminized materials in the TMG rather than the fourteen used for Apollo suits. Another new feature of the Shuttle EMU was its Hard Upper Torso Assembly (HUT), a rigid fiberglass shell on which the backpack was mounted. Fabric arm and lower torso coverings and a rigid helmet were joined to the HUT with rigid bearing joints. Similar rigid structures are seen in designs for future space missions, such as one to Mars, for which completely rigid hard suits, much like deep-sea diving suits, have been developed. These suits are purported to allow greater ease of movement, and be more durable, lighter-weight, and easier to don than previous space suits. Harris, Gary L., ed. The Origins and Technology of the Advanced Extra-Vehicular Space Suit. American Astronautical Society History Series, Vol. 24. San Diego: Univelt, Inc., 2001. Joels, Kerry M., and Gregory P. Kennedy. The Space Shuttle Operator's Manual. New York: Ballantine Books, 1982. Kozloski, Lillian D. U.S. Space Gear: Outfitting the American Astronaut. Washington, D.C: Smithsonian Institution Press, 2000. Mohler, Stanley R., and Bobby H. Johnson. Wiley Post, His Winnie Mae and the World's First Pressure Suit. Washington, D.C: Smithsonian Institution Press, 1971. Watkins, Susan M. Clothing: The Portable Environment. Ames: Iowa State University Press, 1995.